So you want to fix your jeans. You want to shorten the legs, but you also want to keep the original hem, like some kind of fancy pants. 1) Figure out how much you want to shorten your jeans, and divide that number by 2 (example: if you want to shorten the legs by 3″, divide by two and you have 1.5″). 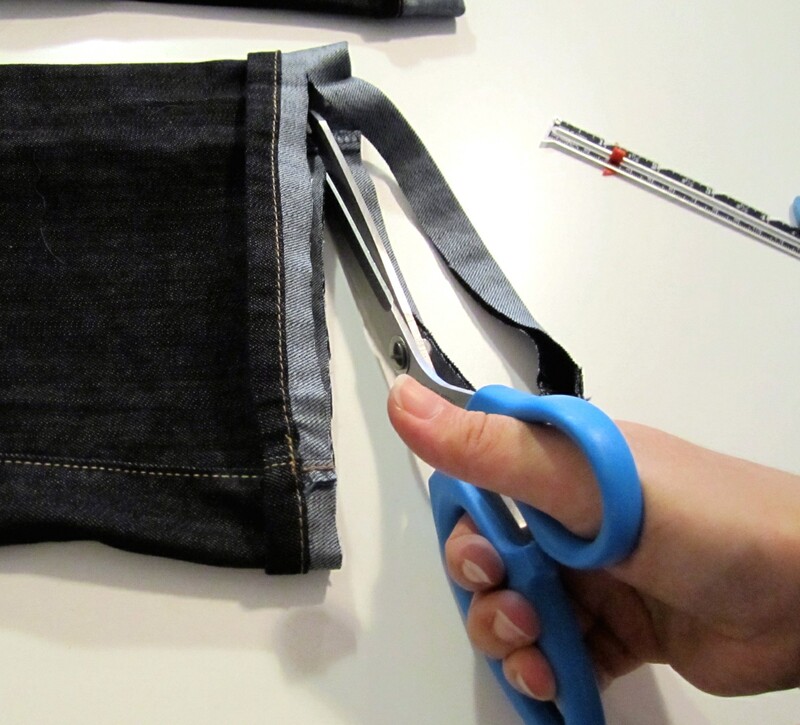 2) Take your jeans, right side out, and fold up the hemline into a cuff. Measure that cuff so that it’s the same length as your divided number (1.5″). Pin. That doohickey I’m holding in the picture is called a sewing gauge. 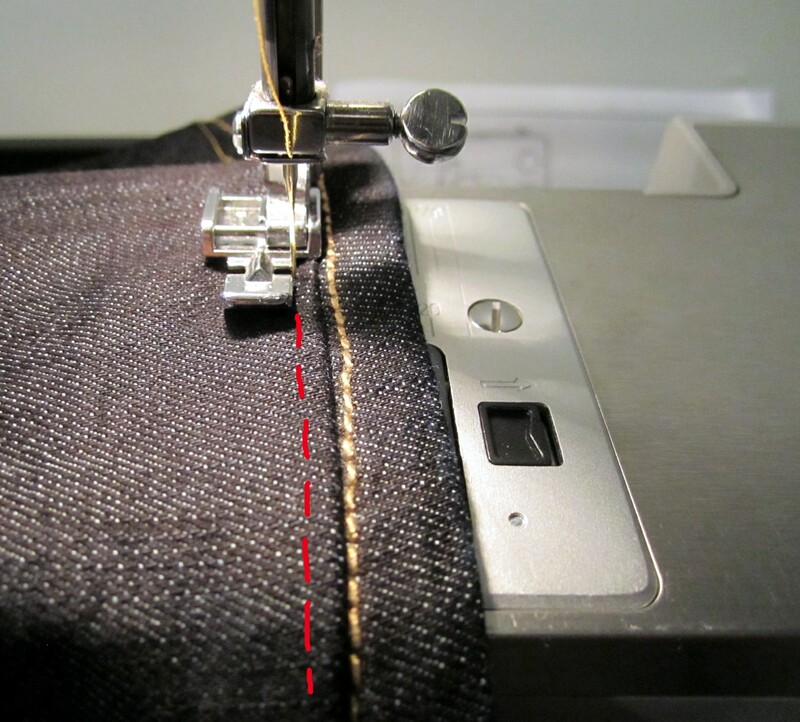 You slide that red thing to the desired measurement and use it to make sure that your hem is the same length all the way around. Supposedly, you can even use that little pointed tip (on the bottom left of the ruler) to poke out the sharp corners of your pillows and collars and whatnot. I tried that once, and poked a hole through my fabric, so be wary. 3) Sewing time! 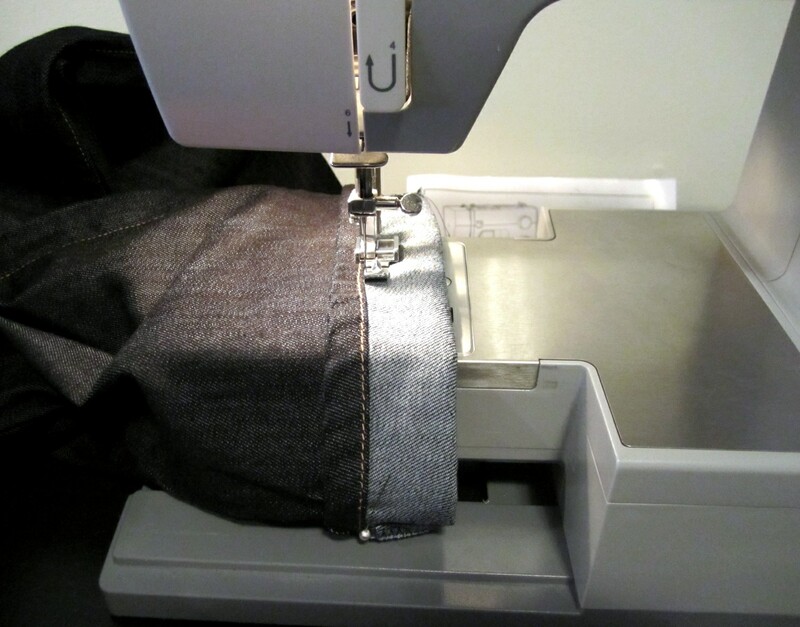 You’re going to attach your standard zipper foot, and sew all the way around the hem, as close to the hem as possible, without actually sewing on the hem. 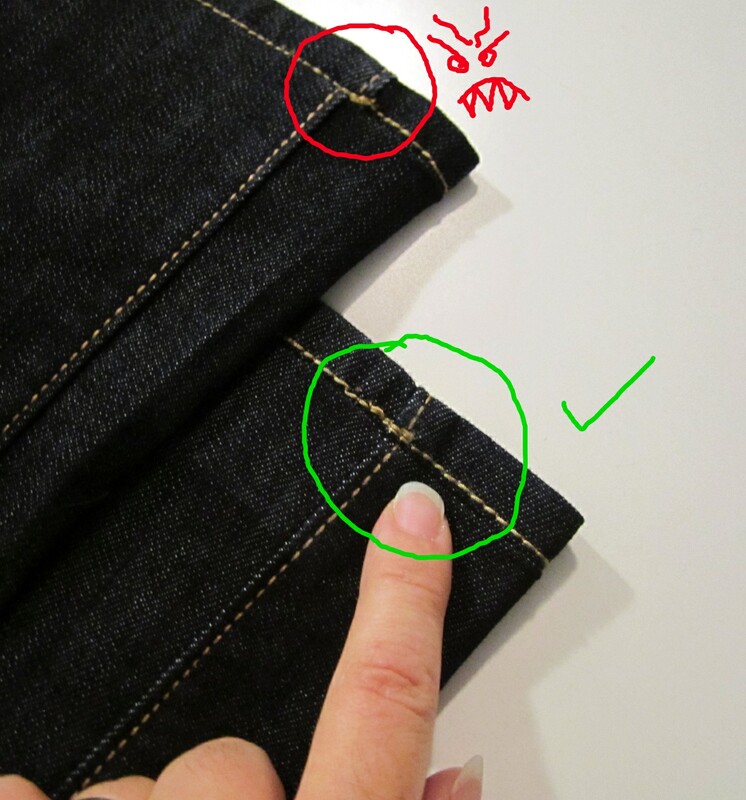 Keep your jeans right sides together, right side out (as they are already). 4) Pay close attention when you get to the side seams. 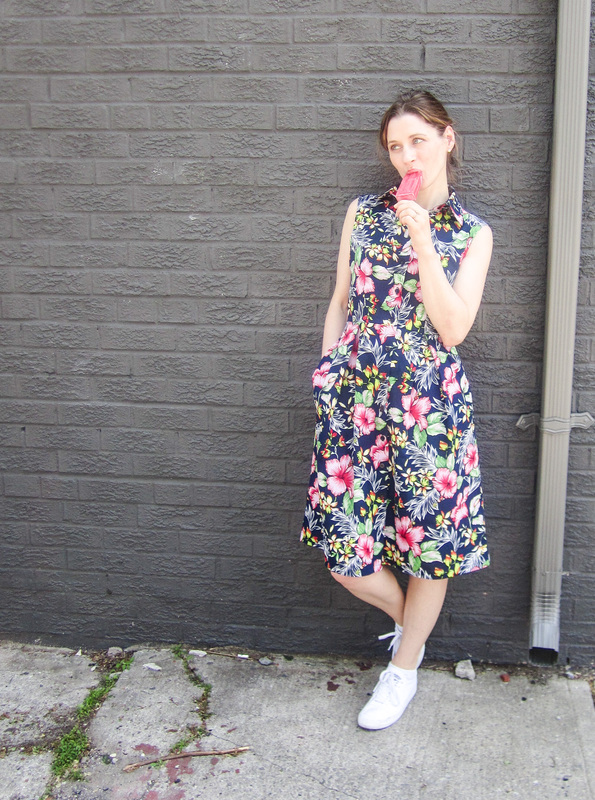 You want the side seam below the hem to match up with the side seam above the hem. Otherwise everyone will know that you fixed your own jeans, and they’ll laugh and call you Squat Shanks. 5) After you’ve sewn one leg, it’s good to take a fitting break. Try on your jeans and see if you’re happy with the new length. If you’re happy, proceed to leg 2. If you’re not happy, pull out your stitching, swear if needed, and start all over again. 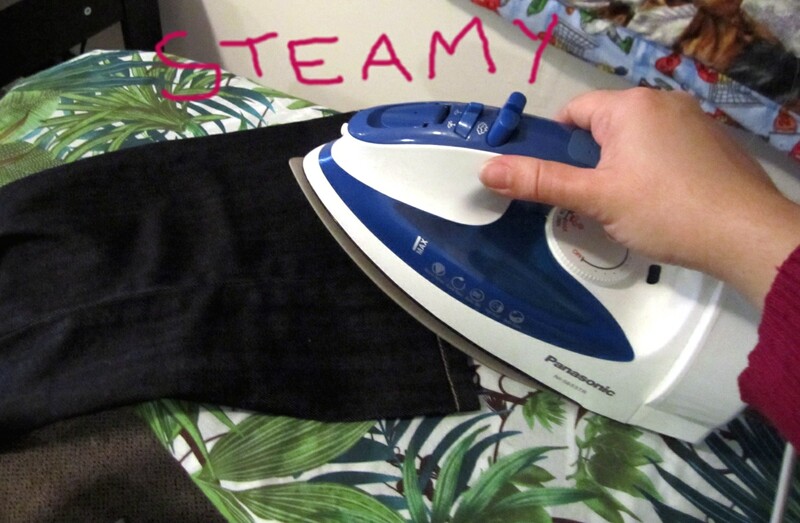 6) After you’ve sewn both legs and are satisfied with the results, turn the cuff down and steam those hams. 7) Now you’re going to top stitch that baby. 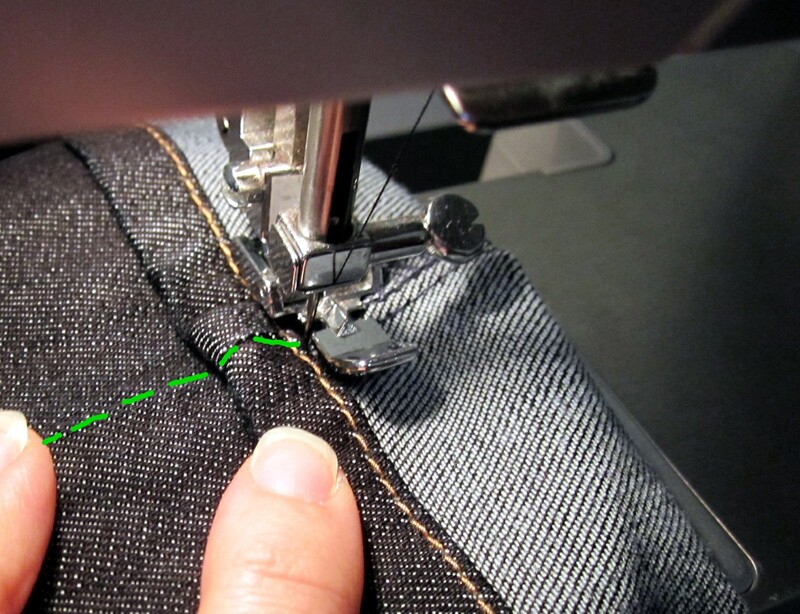 If you have topstitching thread that matches the thread on your jeans, and you like the idea of have a double stitching line at your cuffs, you can try that out. In my experience though, most domestic sewing machines (ie not industrial) have difficulty sewing with topstitching thread. Topstitching thread is quite thick, and my machine (Singer Heavy Duty 4411) skips stitches when I try to use topstitching thread. Topstitching thread. So if you prefer, you can use regular thread that either matches your jeans thread, or that matches the colour of your jeans. If your thread matches the colour of your jeans, then people won’t be able to see your new stitching line, they’ll just see the original hem. 8) Flip your zipper foot to the other side, and sew down that cuff. 9) If you didn’t shorten your jeans by too much, and the excess fabric inside the pant legs doesn’t bother you, you can slap on your newly hemmed jeans and call it a day. 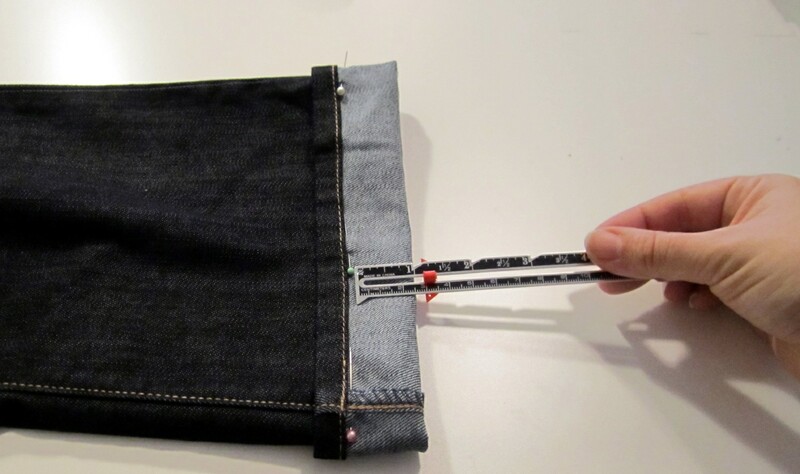 However, is you shortened the jeans by more than 2″ then maybe you’d like to trim the excess and serge or zigzag the raw edges. 10) Flip your cuff back up, and trim off the excess fabric, making sure that you don’t accidentally trim above the hemline. 11) Seal off the raw edges so that they don’t fray and betray your secret hemming. If you have a serger, you can serge. If not, you can zigzag around the raw edge with your regular machine. 12)Done. Wear your new jeans with pride.